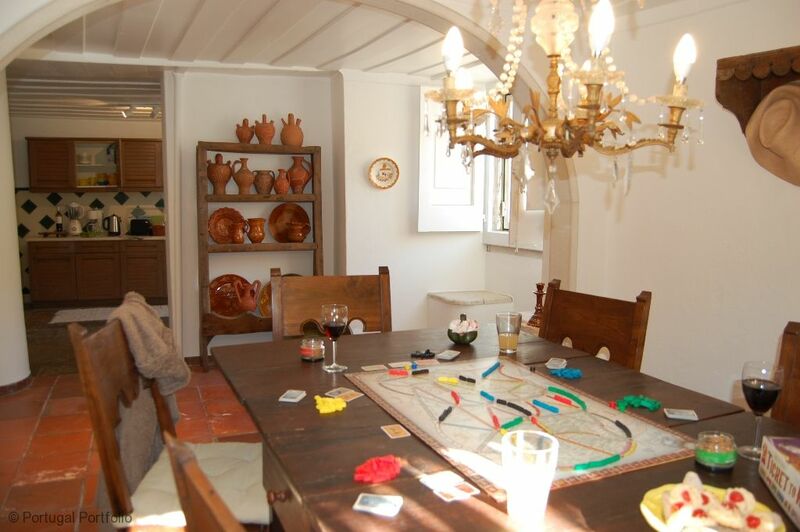 Charming is the best way to describe this historical Portuguese villa. It offers a green oasis of a garden with distant views of the sea and a welcoming patio for enjoying meals alongside the outdoor jacuzzi pool (3.5m diameter) - perfect for cooling off in. 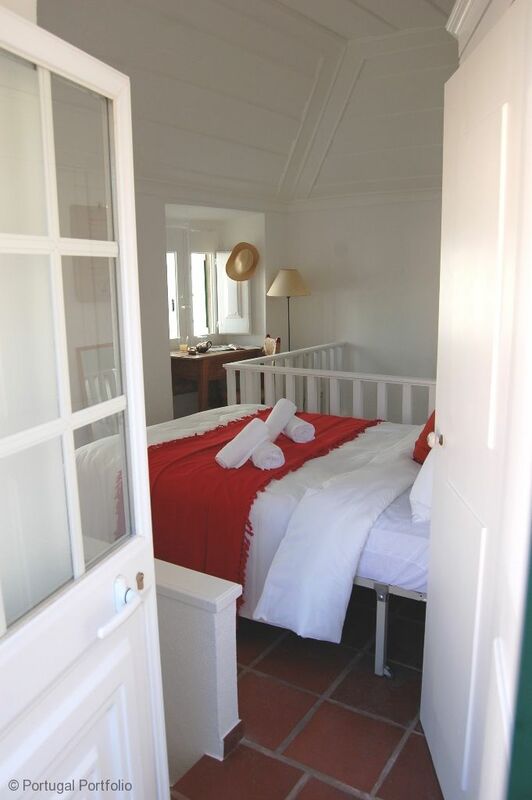 The villa may be split into two separate units, being the main house plus an apartment.. You have a choice of excellent sandy beaches nearby, this quiet haven is 28 km west of Lisbon. Shopping can be done at the nearby villages of Almoçageme and Colares, as well as at the little convenience store next to the church in Penedo, selling fresh bread each morning. Enjoy a local lunch at the village café & restaurant or make your own after a shop at the very local fresh fruit and vegetable market. It sets up along the main road a few minutes from the house, on weekends and holidays. They also sell flowers, sausage, bread and cheese. Large fully equipped kitchen with wall units includes fridge-freezer, 4 ring gas hob,electric oven with grill, Nespresso and normal coffee-maker, dishwasher, clothes washing machine, microwave, kettle, blender, mixer, toaster, juicer, iron and ironing board as well as handheld and normal vacuum cleaner. The apartment has its own fully furnished kitchen, with induction cooker, microwave, fridge, electric kettle, toaster, iron and vacuum cleaner. Ground floor living room is comfortably furnished with a sofa and 2 armchairs. Their is a newly installed log fireplace and flatscreen TV. In addition there is a reading/playroom with a sofa on the ground floor. The mezzanine living space has fireplace «, flatscreen TV, sleeper sofa and 2 chairs. The large dining room with wooden table seats ten people under the feature faux chandelier. This large living area is great for entertaining. There is an outdoor terrace, with a table and 6 chairs with access from the first floor living room and from the dining room for alfresco dining. The apartment bedroom has a small sunbathing balcony with a table and 2 chairs. The garden has an outdoor Jacuzzi pool (3,5 m diameter, for cooling off and relaxation). There are 4 lounge chairs in the garden, a beautiful designed mosaic bench and a stone bench. There is plenty of space to park 2 cars inside the property. 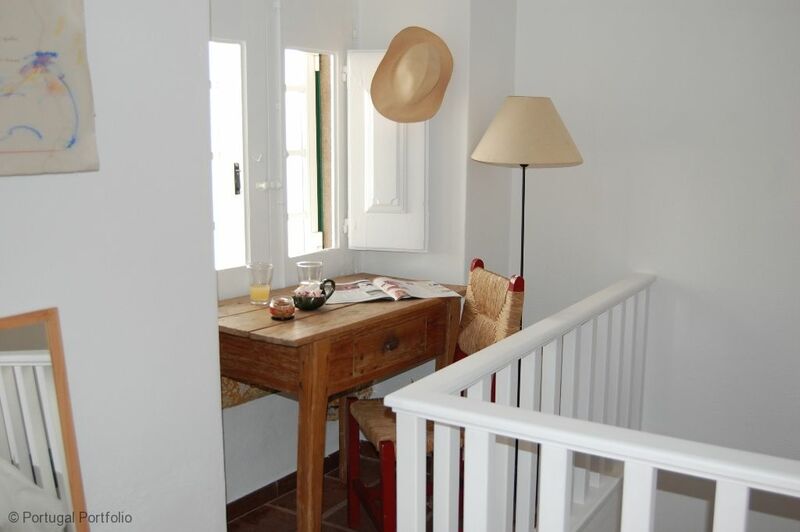 Conveniently located just off the church square in the picturesque and historic village of Colares within the Sintra UNESCO World Heritage area. Colares has many amenites including restaurants, cafés, bank, chemist, grocery stores, local market, bakery, butcher and post office. The local beaches - Praia da Adraga , Praia Grande and Praia das Maças - are all within a 5 - 10 minute drive. There are more beaches in Cascais and Estoril which are a stunning 15 km drive away along the Atlantic coast road. Sintra itself is just an 8 km drive. And with Lisbon only 25 minutes away and Cascais only 15 minutes, you can get all the cosmopolitan and night life you need. A short distance away you can enjoy a lovely lunch or dinner at the Restaurant Adrage at Praia da Adrage, the closest beach. Pay a visit to Cabo da Roca, the most westerly point of Europe where you can enjoy a cliff top walk with spectacular views and visit to local tourism point. There are many walking routes in the mountains and in the parks (parts of it protected by World Heritage), if you wish we can provide information and/or contacts to the local walking groups. Just north of Sintra is the delightful old town of Ericeira takes you back in time to the days when it was a tiny fishing village. Cobbled streets, white-washed houses and a plethora of restaurants and cafes offer excellent food, especially the sea-food for which Portugal is deservedly famous. When in Cascais, take a stroll through the local park. Parque Municipal da Gandarinha in Cascais is located opposite the marina and beside the cultural centre. Feed the ducks - or just sit at the local café and read a book whilst the peacocks strut around you. The Lisbon tourism office is situated on the water front just beside the casino gardens and opposite the Estoril train station. "We stayed one week in this really nice old house on the hill, with a beautiful view to the ocean from the garden. The house is very good for a family or a group of friends. Most beds are comfortable for example the master bedroom. The others a bit less. The rooms are very cosy and the kitchen was OK really. We did not use the jacuzzi very much because the weather was quit cool during our stay. Very strange that the pool kept on bubbling during the whole week. It kept us awake sometimes. The garden is very cosy too and we had a real good time having our breakfasts there. The house is along a very small street with a lot of curves so very often you heard horning of the cars, but that wasn’t during the night. 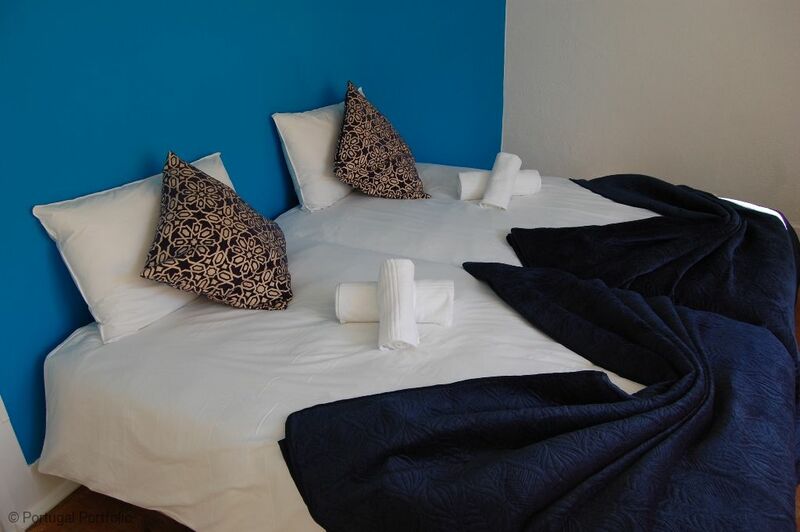 The location is perfect near Sintra and a lot of nice beaches although you will need a car to get there while the street is very small and quit dangerous to walk with your whole family and also walking back you have to climb a few kilometers. 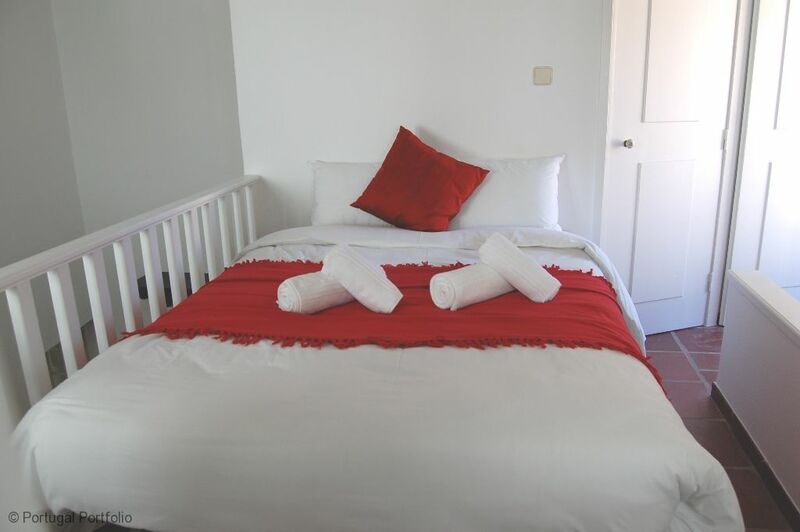 “A super cosy and authentically decorated house with large bedrooms and good bathrooms. The kitchen is well equipped to cook an extensive meal. Very nice and cosy garden. Good location for trips to surrounding cities, to beautiful beaches, castles and parks. Highly recommended for those who want a vacation with a larger group (8 people) in a house were you can feel at home. And last but not least, a very good service. Cassie is a super woman! Agnes from Ghent, I was there with my children and grandchildren” . Even the weather was not that good, we had a great time !" If you want to stay in an authentic small Portuguese village and home this is the place! The traditional stucco house is situated in a lovely lush garden with large palm tree and vines over the entryway. Inside this cozy and clean house is filled with original artist works including tile, paintings, dishware and sculptures. Bedrooms wrap around the axis of the house so each has a unique window view and all afford privacy. The living room fireplace offers a great respite to warm yourself, relax and plan your daily outings. Nice size dining room and kitchen for cooking and entertaining. Especially beautiful, peaceful vista view from the patio toward the lower section of the village. 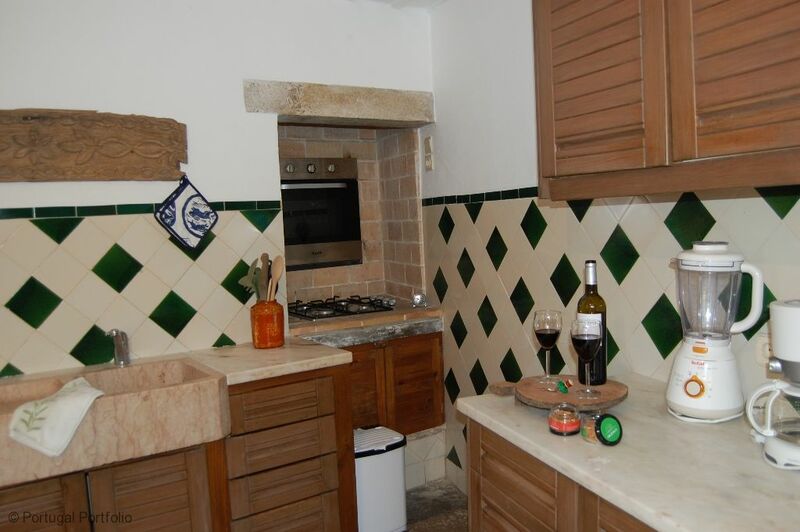 Gated off street parking included – a must in this small village where streets are very very narrow. Local coffee shop and village grocery both within walking distance. Sintra is a short drive, about 9 miles, for historic sights and entertainment. Almocageme another quaint Portuguese village and beautiful pristine beach are about 10 miles away. The hostess is responsive and very helpful! A group of friends stayed in this charming house during the winter last year. 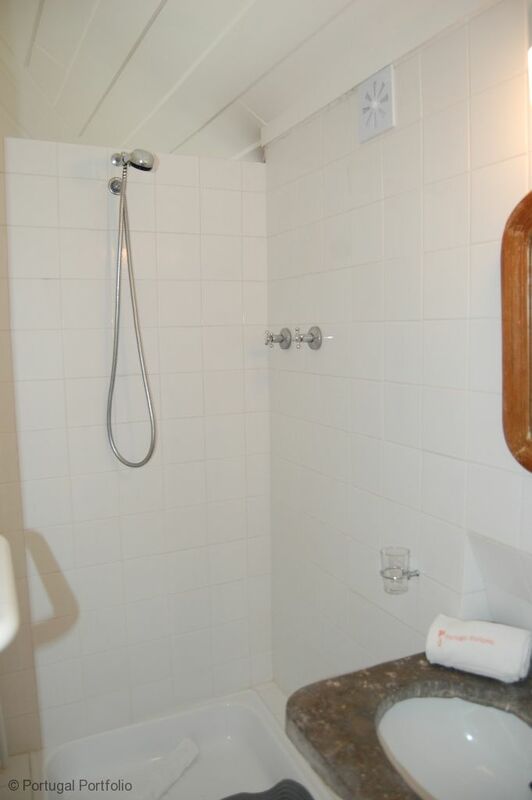 It has an artist's charm, full of unique and welcoming art and furniture, with all of the amenities a traveler needs. Lots of space to spread out, and a kitchen equipped with pots and pans and coffee accoutrement! We enjoyed excellent wine in the dining room as we plotted our next day's travel, and gathered in the living room for morning coffee. Unless you travel very light and enjoy hikes, you will need a car, as the village is on a steep hill, and the house is almost at the top of it. A short climb from the house, very walkable, is a handy store and cafe. One day we walked to a nearby beach also. All of our other explorations involved a car, and there is convenient parking in the courtyard for your steed! Because it’s so close to Sintra and Lisbon, it makes for the perfect centrally located getaway spot. Only 18 miles from Lisbon, it’s very easy to take the bus to Sintra and catch the fast train to Lisbon for a day or weekend visit. (The transport system is very easy to understand, too.) We had a rental car for our visit so we were able to take in the numerous attractions nearby the home. If you are a surfer, there is a great surfing beach very close by car. Other areas with easy access are Monserrate, Capuchos monastery, and several enchanting coastal towns. My favorite close jaunt is either the walk to Almoçageme, a typical Portuguese village, or further on to the beach Praia Adraga. (Also close are many other beaches like Praia Macas and Praia Grande/Pequena.) Almoçageme is a charming little town and is great on a Sunday because all the families come out to the center square for social time. All generations are present and it really provides an authentic Portuguese family experience.